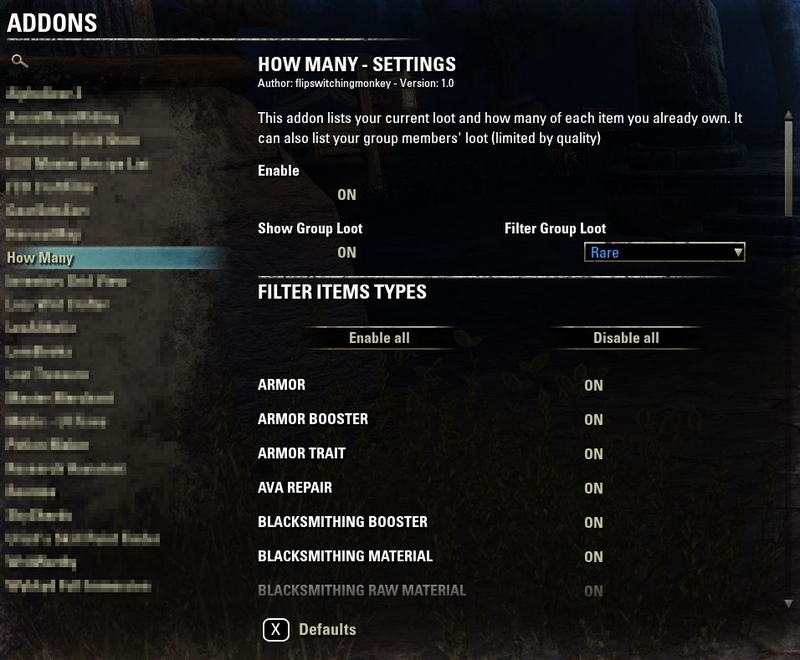 How Many is a simple ESO addon that display's the amount of whatever you looted, and how many of the same items you already own in your Bag, Bank or Crafting Bag. I created it because I like keeping an eye on my stock whilst harvesting. Maybe you do too. Since version 1.0.5 it now includes a fine grained item filter and a proper Settings dialog thanks to libaddonmenu. By default "on" it will only show your own loot, with a summary of your stock next to it. "showgroup" will also show you what your group members looted and how much, but not their (or your) stock of it. "hidegroup" turns this off again. "off" turns on the addon function entirely. 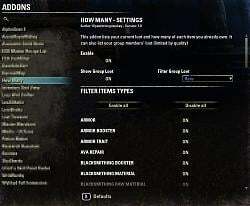 1.0.2 - Added option to show or hide group loot, added a filter to only show your own loot based on your character name. I normally do not keep my chat box expanded but I do now so I can glance over while looting to see if I got something I don't have banked. Small, simple, and very cool - thanks! Will this addon replace all of the features of Lootdrop?